Albuquerque's public art can be found in so many of the city's neighborhoods and common areas. The city has a 1% for the arts initiative that allows one percent of funds from the general obligation bond program and from certain revenue bonds to be taken so that art can be purchased or commissioned. The program began in 1978 and is one of the oldest in the United States. Currently, the collection contains more than 700 pieces of art found throughout Albuquerque. The public art program begins with a specific site in mind, and then program staff works with the mayor's office to find a work that would be suitable for the site's surroundings. Many things are considered when choosing an art piece, such as how it relates historically and culturally to the site. The artist is commissioned to create the work and it is installed to be admired by all passersby. The city's public art pieces can be found downtown, in Nob Hill and in the Old Town area. They can be found in the Sandia foothills and the Albuquerque airport. They can be found in the Northeast Heights and more. There are several ways to discover the works of art. Some can be seen from the comfort of your car, some while passing through the airport to catch a plane, and for those who love to ride bikes, there is an Albuquerque Public Art Bicycle Tour which was created so that enthusiasts can enjoy the art while taking in a bit of cycling. What are the art pieces found in the public art collection? The ones found outdoors have to, of course, be able to withstand the elements, so they tend to be murals or sculptures or installation pieces. Downtown at 3rd and Tijeras the Glenna Goodacre sculpture "Sidewalk Society" features life sized statues of men and women gathering on a street corner. At the Albuquerque Convention Center, students from the mayor's summer art institute add to a tile mural that features bright colors and patterns that tell a story. The mosaics began in 2001 and more than a dozen segments have been created since highlighting the city's history and traditions. At UNM, a Luis Jimenez sculpture, "Fiesta Jarabel" portrays a man and woman dancing in bright colors directly in front of Popejoy Hall, the university's center for the arts. Further on the campus is "The Center of the Universe," a concrete underpass popular with students. And in Nob Hill, the neon overpasses at Central and Girard and Central and Washington remind visitors to the area of the heyday of Route 66 and its part in building the area into what it is today. Some of the tours can involve the whole family. The BioPark Zoo features a scavenger hunt that will have kids looking for works of art. They'll find carved wooden animals in the Cottonwood Cafe, a mosaic throne they can sit on in the Africa exhibit, and more. 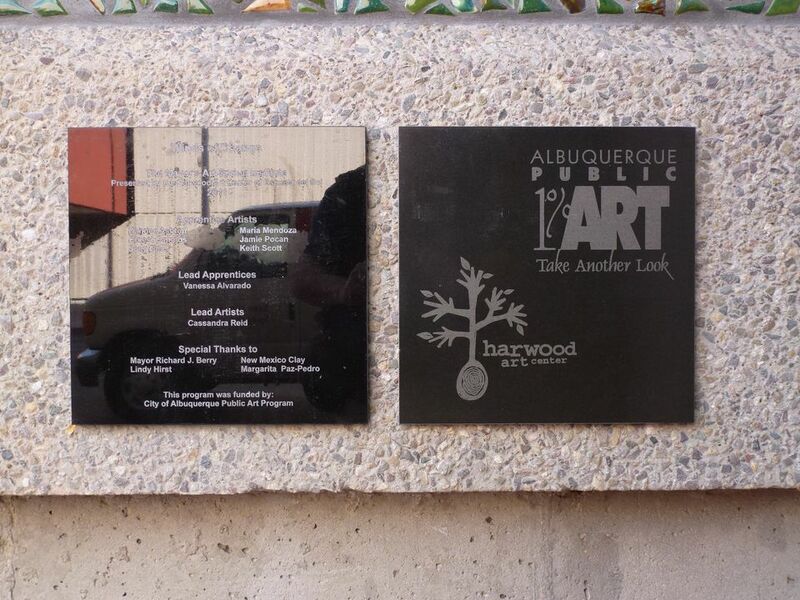 The Albuquerque Public Art Program also includes the Albuquerque Cultural Plan, which advocates for arts education and arts funding. The Urban Enhancement Trust Fund is also a part of the program and provides support for art projects and services. The program has a conservation component that maintains and provides care for works of art.